I’ve done track days on and off in cars for years, but I swore I’d never do one on a bike. “If I’m going on a track, I want a metal cage around me,” I always said. 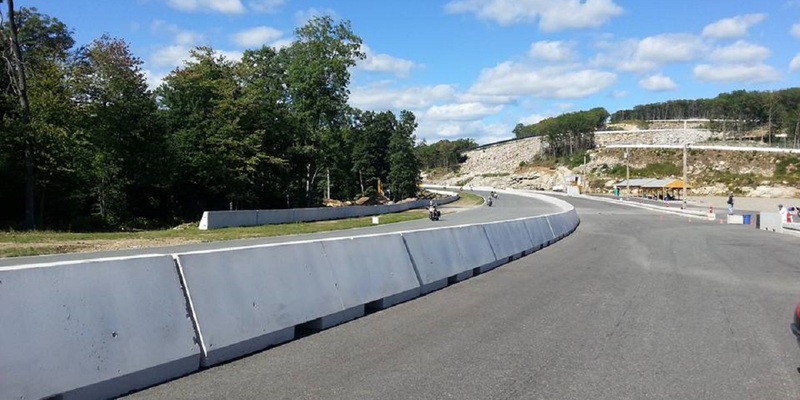 Earlier this week I ate my words at Tony’s Track Days’ non-sportbike event. You may have already read what Jason Macierowski had to say about it. I, like Jason, was riding on a track for the first time, and in the fast run group as well. But I had an advantage that Jason and most of the other riders didn’t. This wasn’t my first rodeo at Palmer Motorsports Park. Last year I spent two days driving this track with Chin Motorsports in my Subaru BRZ. I already knew where to go. Though this was my first time taking a bike to the track, I’ve done about fifteen track days in cars, as well as countless autocrosses, ice time trials, and even two days of training at Team O’Neil Rally School. Because of this, I’ve long considered myself a rather good driver, yet a merely adequate rider. I’ve pondered taking the MSF Advanced RiderCourse at some point, but never quite got around to it. I’ve known about motorcycle track days, but I ride for the enjoyment and experience of riding, not for speed. Besides, racing leathers are expensive, and my Honda PC800 isn’t designed for the track at all. I totally blame Kate Murphy for changing my mind about this, partly because of her article about it. Her Yamaha Super Ténéré is no more a sportbike than my PC800, yet she had a blast at one of these events at Thompson Speedway last year. Additionally, although we’re riding on a track, the emphasis is on skills for the street rather than racing. So with all that in mind, I decided to divert my track day fund to the bike instead of the car. I’m SO glad I did. Again, read Jason’s article for a good overview of what it’s like and what you get out of it. I, too, feel like my riding skills have improved by quantum leaps after the track experience. But I’m equally surprised by just how many of the techniques I learned from performance driving translated over to the bike, many of which I’d already started using before the track day. The racing line is the racing line, regardless of what you’re driving or riding. I first learned how to pick the proper line through corners during my teenage bicycle racing days, before I even had a driver’s license. It’s been more years than I care to admit since I last raced by pedal power, but when I ride my motorcycle on the street I follow the outside-inside-outside line through the curves while staying in my own lane. That’s much of the fun of riding for me, in fact. I don’t need to be going fast or on a track to get the thrill of nailing my line through a tough corner, because it just feels right when you get it. 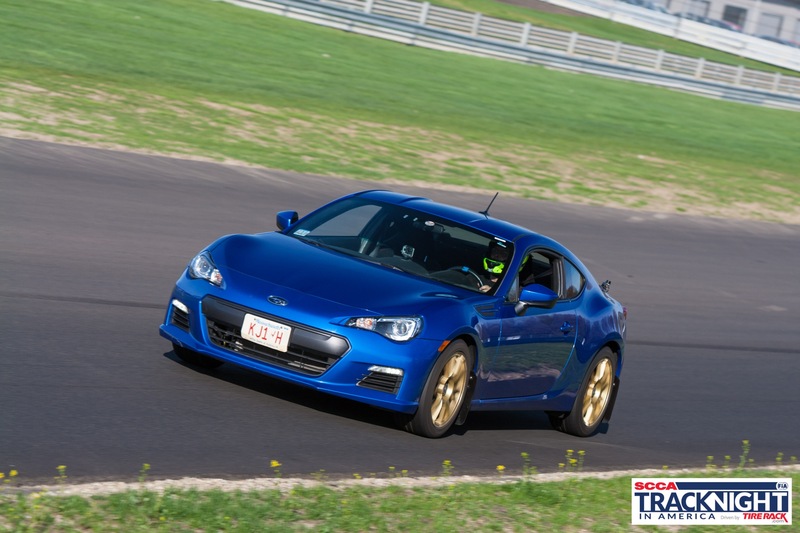 My previous experience at Palmer in my BRZ helped, too. Though some techniques on a motorcycle were different, I already knew where the track went, unlike most people there who were seeing it for the first time. In fact, one CBR rider told me after a session that since I’d driven here before, he’d tucked in behind me for a while specifically to follow and learn my lines. His bike is much faster than mine, but this isn’t a race, and there’s nothing wrong with slowing down to try something different. We often talk about weight transfer when it comes to performance driving. Though side-to-side weight transfer works differently when you only have two wheels, the same theory still applies between the front and back wheels. It’s far more effective to squeeze on the front brake than to jam on it instantly, since more of the bike’s weight has a chance to transfer to the front wheel and give you more traction as you add more braking. Similarly, you want to roll on the throttle when leaving a corner, rather than whacking it wide open, so that weight will shift to the back wheel and give you more traction to handle the power you’re adding. Along with weight transfer comes trail braking. In the past, on a bike, I’ve typically done my braking in a straight line, released the brakes, then turned into a corner. I’ve been afraid of exceeding my traction limits by asking the front wheel to turn and brake at the same time. But part of the classroom instruction focused on trail braking on a bike. The process is really no different than a car. You start to let off the brake as you start to turn in, blending from braking to turning rather than stopping and starting like I’d been doing. During one particular session I struggled to get the bike turned into the apex of turn 7. I was probably carrying more speed into the turn than earlier in the day, and I couldn’t seem to get the bike closer to the apex than the center of the track. Then we discussed trail braking. I tried it during the next session, and doggone if it didn’t work beautifully. Just a little bit of trail braking added enough weight and traction to my front tire to turn the bike more effectively and clip the apex just like I should. In a car I heel/toe downshift. It’s the process of blipping the throttle in the middle of a downshift to match engine speed to wheel speed in a lower gear. My heels and toes don’t perform the same functions on a bike, but the general concept of rev matching my downshifts worked well. It’s a more advanced technique that they didn’t even cover in classes geared toward street riding rather than racing skills, but it helped a great deal. The bike reminded me of this one time when I messed up my rev match, let the clutch out too quickly, and engine braking caused the back wheel to lose grip for a second. That was a pucker moment, but I knew exactly what I’d done wrong and didn’t repeat it. That leads to the biggest difference between driving a car and riding a bike on the same track – there’s so much more room on a bike. The track obviously hasn’t grown larger, but it feels larger on a smaller vehicle. There’s much more room to work with. As a result, I was actually more willing to take some chances with different lines and techniques on the bike than in the car. There was more room for error. And I made a few big errors. In class we talked about double apexing turn 7 rather than using a single late apex. I tried it, but I couldn’t get that line to work for me at all. I actually ended up pretty close to the outside of the track when I was supposed to be at the “real” apex near the end of the turn – a classic early apex result. But in a car, the same mistake would probably have put me at least into the grass, and possibly into the wall, because a car is so much wider. In my case, yeah, I screwed up big time, but I had enough space on the track to slow down and compensate for my mistake without incident. I can’t say the same about my favorite twisty back roads. Another technique that doesn’t translate is countersteering and leaning into turns. This is how I learned to ride in the MSF course, and I’ve been riding this way ever since. But never before had I leaned so hard into the turns. There are too many hazards on the street for me to commit to a corner at the edge of my personal riding skill, with nothing in reserve. But as Tony’s Track Days‘ slogan says, “No cops, no cars, no limits!” Plus I was hitting the same turns every two minutes and forty seconds or so, over and over and over again, so even though many of Palmer’s turns are blind, I knew exactly what was on the other side and could commit to them safely. Plus I had a lot more room for error if I didn’t nail every apex every time, which I assure you I didn’t. One of the major differences I had to get used to was passing. At track days in a car, passing is tightly controlled. The faster car is not allowed to pass the slower, leading car until given the proper signal, a point-by that tells the faster car to pass and on which side. Then it’s up to the faster car to make the pass safely. 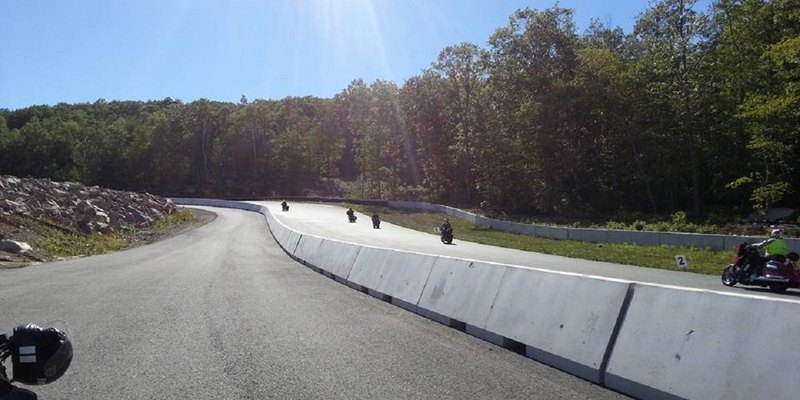 But here, passing was only prohibited between turns 1 and 2 (with the track narrowed by cones to create more runoff area for safety), and after a rider tipped the bike in toward the apex you were not allowed to pass on the inside. That’s it. Plus, our mirrors had to be either removed or taped over to force us to focus on what’s ahead of us, not behind. There was no way to know if there someone about to pass, so it was 100% up to the passing bike to do so safely. I was probably the slowest bike in the entire group, so I got passed frequently. I got passed on the outside of turns regularly. Someone coming from track days for cars might think this is ludicrous, especially with newbies thrown into the fastest run group with basically open passing. But it worked. There was plenty of room on the track for everyone, and since bikes accelerate more quickly than cars we were side-by-side for only a short time. In fact, this avoided the issue I always see at track days for cars where there’s “that guy” who’s going slow and won’t give a point-by, causing a long line of faster cars to get stuck behind him. I was “that guy” here, and it was no problem at all. Finally, the instruction here was different, by necessity. You’re not going to take an instructor as a passenger on your bike as you would in a car. Instead, instructors – experienced racers on sport bikes – rode with the rest of us. Sometimes they’d follow someone and watch what they’re doing before zooming by. Sometimes they’d tap the back of their bike as a signal to follow them. This is exactly what happened to me when lead instructor Ken Condon caught up to me during my second open session. Ken slowed down to my pace, then led me for a full lap around the track, pointing out markers and cones and demonstrating the proper line. The next lap, after Ken sped away, was my fastest of the day despite blowing turn 7 (this was before I’d applied trail braking to pull my line tighter). I learn much better by being shown how to do something rather than being told. The classroom instruction is good, but for me there’s nothing like actually doing it and applying the new knowledge to really drive the point home. What amazed me most was how many techniques from performance driving I’d already carried over to the bike, and that they were right. If anything, I needed to apply even more of them, like trail braking, to improve my riding further. Having track experience in cars definitely helps on the track, but it’s still a very different experience on two wheels. Plus, without a metal cage around you, there is a higher element of risk if you should crash while testing your limits. That’s why full riding gear, head to toe, is absolutely mandatory. But I didn’t see any yellow or red flags all day, which meant that everyone rode more cleanly than they drive at the automotive track days I attend. Maybe being inside a car gives some people a false sense of security that leads to spins and off-track excursions. Everyone I rode with was well in control of their bikes, and rode intelligently enough to leave a margin for error when trying something new. The final piece of knowledge I took away from this event was that I don’t have to worry about having to choose between being able to attend more events like this or my current desire to buy a cruiser. There was an entire run group for cruisers, and it inspired me to see all those flashy Harleys, Victories, and such out there on the track doing their thing. Cruisers are the slowest of the three run groups, but that doesn’t matter to me. I’m not out here to go fast. I’m out here to learn, and I can learn on a cruiser just as well as a PC800 or any other bike. I’m already looking forward to going back for more next year, whatever I’m riding by then.